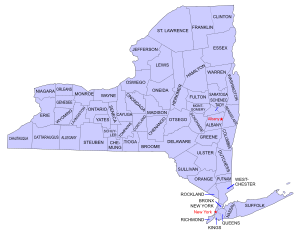 It is illegal in the state of New York to operate a motorized vehicle with a blood alcohol concentration of 0.08% or higher, to operate a motorized vehicle if you are under the age of 21 and your BAC is 0.02% or higher or to operate a commercial motorized vehicle with a BAC of 0.04% or higher. Drivers may also be charged with DWAI if their BAC is between 0.06% or 0.7%, but the state is able to prove that their driving was impaired by alcohol. Drivers may also be charged with an aggravated DWI if their BAC is 0.18% or higher. If you are convicted of a second DWI in New York within 10 years from the first DWI this will be a Class E Felony. Costs can range from $1,000 to $5,000, minimum jail sentence of ten days in jail or community service. Additionally, your license may be suspended for one year and you will be required to install an ignition interlock device. We recently had a driver on our DUI forum ask about the penalties he might face if he has been charged with a second offense aggravated DWI. If this offense is within five years of the previous DWI he may face fines of $1,000 to $5,000, mandatory jail time of 4 days to 4 years or community service and a potential loss of his license for 18 months. The penalties listed above are criminal penalties, which may be imposed in addition to civil penalties by the Department of Motor Vehicles. If you failed the BAC test with a blood alcohol concentration which exceeded the legal limit of 0.08% or higher or you refused the chemical test the DMV can also impose a lengthy license suspension. The DMV penalties are civil penalties which are imposed under New Yorks Implied Consent laws and are not dependent on a DWI conviction. The ignition interlock device (IID) is a breath alcohol measurement device. New York drivers are now required to install this device for at least 6 months for all DWI convictions in New York. The IID will require the driver to provide a breath sample into the device prior to driving. The IID measures the alcohol concentration in the drivers blood prior to allowing the driver to drive. Can I get a reduced charge for an aggravated DWI? Another consideration with an aggravated DWI charge is whether the driver may be able to get a plea bargain agreement. Unfortunately, if your BAC was above 0.18% and you have been charged with an aggravated DWI it is VERY difficult to get your charge reduced to anything less than a DWI, which is considered a criminal charge. If you have been charged with a second DWI it is time to talk to a DWI lawyer. New York DWI laws are complicated and a DWI lawyer can review your case and discuss your options.